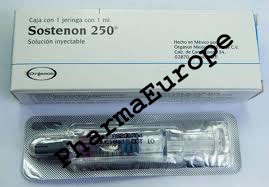 Sostenon 250 is a blended steroid known for its fat burning and muscle building qualities. 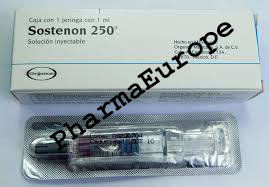 Sostenon 250 is an oil-based injectable containing four different testosterone compounds: testosterone propionate, 30 mg; testosterone phenylpropionate, 60 mg; testosterone isocaproate, 60mg; and testosterone decanoate, 100 mg. The mixture of the testosterones are time-released to provide an immediate effect while still remaining active in the body for up to a month. 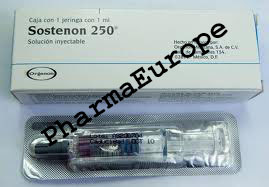 As with other testosterones, Sostenon is an androgenic steroid with a pronounced anabolic effect. Therefore, athletes commonly use Sostenon to put on mass and size while increasing strength. However, unlike other testosterone compounds such as testosterone cypionate and testosterone enanthate, the use of Sostenon leads to less water retention and estrogenic side effects. This characteristic is extremely beneficial to bodybuilders who suffer from gynecomastia yet still seek the powerful anabolic effect of an injectable testosterone. The decreased water retention also makes Sostenon a desirable steroid for bodybuilders and athletes interested in cutting up or building a solid foundation of quality mass. Dosages of Sostenon range from 250 mg every other week, up to 2000 mg or more per week. These dosages seem to be the extremes. A more common dosage would range from 250 mg to 1000 mg per week. Although Sostenon remains active for up to a month, injections should be taken at least once a week to keep testosterone levels stable.